Happy Valentine's Day everyone! I'm not a super big valentine's person because I strongly feel that it's such a commercial holiday and forces people to buy flowers and chocolate just because everyone else is. Plus, all that stuff is just so expensive- $80+ for flowers that die. Seriously? What happened to just spending time with the one you love without all the bells and whistles. Shouldn't you just do that everyday anyways? Okay, I'll get off my soapbox now, but do you see what I mean? Hopefully I am not the only one that feels this way. Whether it's valentine's day or not, a little chocolate always makes everyone feel better. Just saying. This year I wanted to try out some new recipes for my valentine. I have been so busy recently and now that grad school applications are done and my life is back to normal (as normal as it can be), I wanted to be extra lovey dovey and make some special sweet treats. One of my favorite food bloggers, Jessica, from How Sweet Eats posted this amazing truffle recipe earlier this week and as soon as I saw it, I knew I had to make them. 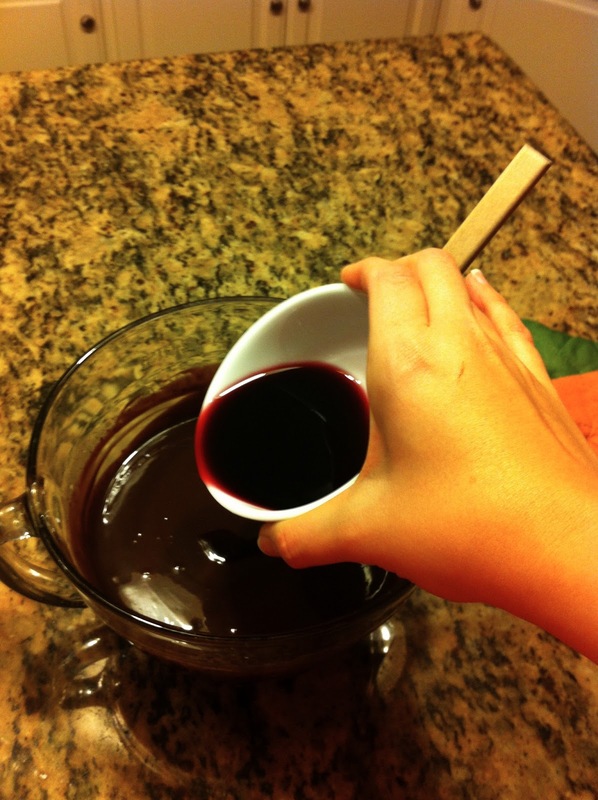 I've made truffles before, but never with wine. How had I not thought to do this before? I have a red wine chocolate cupcake on my "must try" list, but how did not I not have a truffle? Oh well. I just wish I though of this first! Next time. Let me just say, truffles are so much easier to make at home then you think. No really, they are super easy. You really only need two, maybe three ingredients - chocolate, heavy cream (not whipping cream!) and flavoring (coffee, wine, liqueurs). That's seriously it. Bring your cream to a simmer on the stove and then pour the hot cream over the chopped chocolate. Don't stir and don't mess with the mixture. Just let sit and do it's thing for about three minutes. Once the time has passed, you'll be able to mix the melted chocolate and cream into a smooth and beautiful mixture. Don't be digging your spoon into it just yet! Here comes the hardest part - you must let the chocolate mixutre cool and firm up. The first time I made these, I accidently used whipping cream instead of heavy cream (the fat content is important for the right consistency!) and the poor truffles just didn't set up. It was absolutely delicious, but it was more of a frosting like consistency than firm and rollable for truffles. I thought that maybe it just needed more time in the fridge, but that didn't work. Darn. The good news is that I didn't have a kitchen tantrum. Progress! I didn't let this first attempt bring me down. I decided to try the recipe again, this time with heavy cream. I am not sure why I even bought whipping cream in the first place. I had been a long day at work and I must have grabbed the wrong container at the store. Oops. I also eliminated the wine thinking that this may have provided too much liquid. Who knows what was the issue, but, I redid the truffles and they finally turned out! These truffles do have a soft texture, but at least this time they could be rolled and shaped. Hallelujah! Now, you can get all fancy and dip your truffles in chocolate, but the easiest thing is to roll them in cocoa powder. Rolling them gives your truffles that little something something extra. That something special. Plus, it kinda helps them from softening all over when they sit out for a bit. Additionally, you can also roll them in chopped nuts or even better sprinkles! Because this recipe was valentine's day inspired, I went with pink and red sprinkles. They were just too cute to resist. Don't let me influence your decision though. Well, that is for the coatings. I will tell you that you need to make these. If it's not for valentine's day, maybe for a birthday, or just because. Let's be honest, who doesn't love a truffle anytime of the year. Especially when it's made with wine (the flavor on the first batch was amazing!). I don't know why I thought I needed butter. Oops! adding in the vino on the first try. rolled and ready for sprinkles -second attempt = success! close up of the sprinkles. just because. homemade truffles. such a beautiful thing. Add chopped chocolate to a large bowl. Heat heavy cream in a saucepan over medium heat. The minute it starts boiling, remove from heat and pour over the chocolate. Add wine. Let sit for 3 minutes, then whisk continuously until smooth. Press a piece of plastic wrap over top of the bowl and press down so it adheres to the chocolate. Refrigerate for at least two hours (I did so overnight - perfect! ), then using a small melon baller or spoon, scoop chocolate out and roll them into balls, placing on a sheet of wax paper or non-stick foil. Roll the truffles in cocoa or sprinkles, then refrigerate for about 30 minutes before serving. I definitely like these best cold, but they can sit out at room temperature for a few hours too. I do keep them refrigerated when not serving. Makes about 20-30 truffles depending on size. Wine + chocolate = love. Enough said. 200th Post - The Best Bran Muffins EVER!